For example, in County Tipperary, the lovely Aherlow Woods Holiday Homes development is entirely in keeping with its setting in the heart of the Glen of Aherlow Nature Park, surrounded by the Galtee Mountains. This is a great destination for walkers and mountain bikers, while Tipperary Golf Club and trout fishing are other options. With Irish Ferries’ offer, a 14 night holiday this autumn at Aherlow Woods starts at £443 for two adults, including return ferry crossings for a car. Each stone-built cottage has two doubles and a twin room, which means that up to four additional adults can come along and pay only £16 each for their 14 night holiday! In glorious West Cork, there is two weeks for the price of one at Harbour View Homes, a collection of modern townhouses in grounds with harbour views in the colourful seaside town of Glengarriff. A 14-night self-drive ferry package for two adults starts at £445, with up to four other adults paying just £16 each. The smart holiday homes have two double and one twin bedroom, so sleep six easily. Glengarriff is an ideal base for scenic drives along the Wild Atlantic Way, around the rugged Beara Peninsula to Kenmare, or south around Bantry Bay and to Skibbereen. 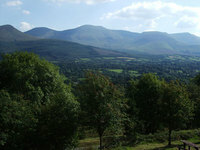 Head inland, over the mountains for a rewarding loop around the Ring of Kerry and Killarney Lakes. In all cases, the package includes 14 nights’ accommodation and return cruise-ferry crossings from either Pembroke to Rosslare, or from Holyhead to Dublin for a car and two adults. Additional adults pay £16 and any children are completely free.